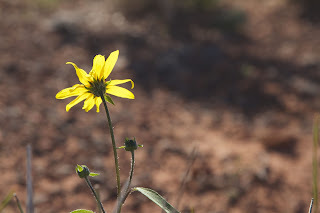 That was the lesson we learned on this year's trip to the Southwest. When planning our post-Overland Expo trip this year, a lot of emails flew back and forth in the days prior to departure. 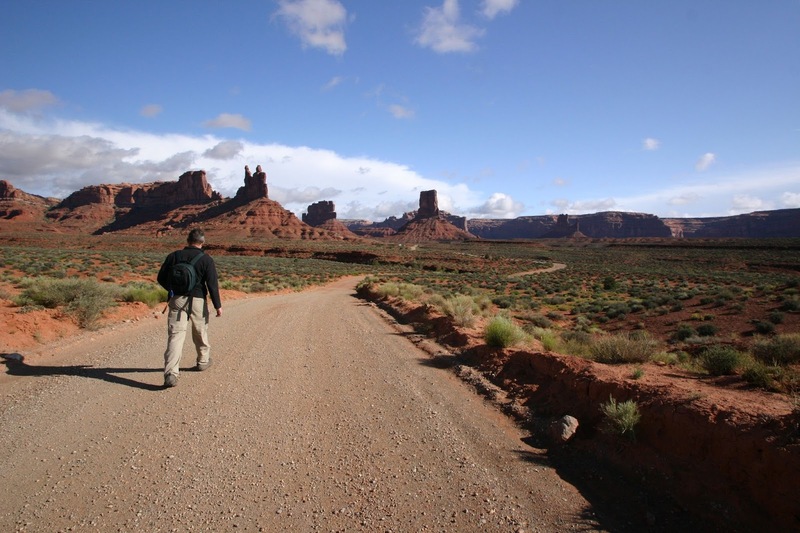 What about White Rim Trail in Canyonlands? Camping there was already booked up. How about Moab? Always fun, but crowded. Grand Canyon? We did that last year. 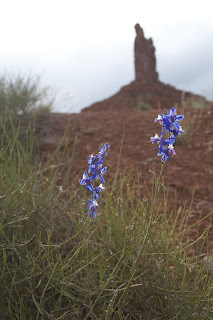 Craig mentioned he had always wanted to go up the Moki Dugway, having been down it before but never up. And by the way, Valley of the Gods is just a hop skip and jump away from there. And after consulting a map, he realized Muley Point was just up the road, and wouldn't it be fun to go visit the Hawaiian Rolls? That's crazy talk Craig, but ok, we're game. A little background: Craig is an archaeologist, specializing in aviation. His work life is devoted to studying crash reports, satellite photos and old photographs looking for clues as to where missing aircraft from as far back as WWII might have gone down. When he's fairly sure he's got the right area he drives out, hikes out and tries to find the rusty bits and pieces that might indicate he's found the site. He's a man obsessed, but in a good way. 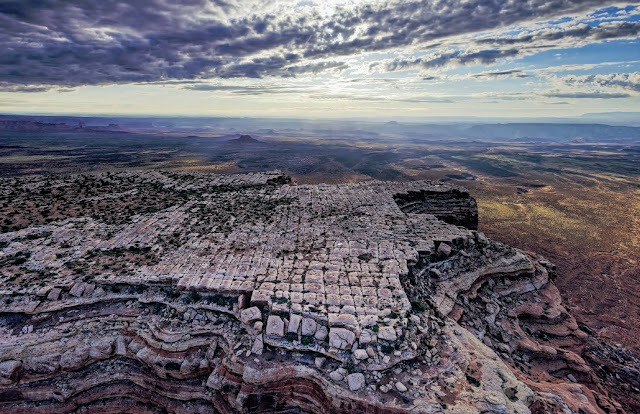 He became so enamored with this picture he spotted in an Archaeology Southwest magazine issue, he studied Google Maps satellite view until he narrowed down where it might have been taken. 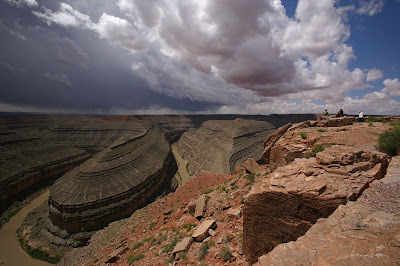 What he came up with was a mesa near Muley Point Utah, accessed by the Moki Dugway, just adjacent to Valley of the Gods. Voila! 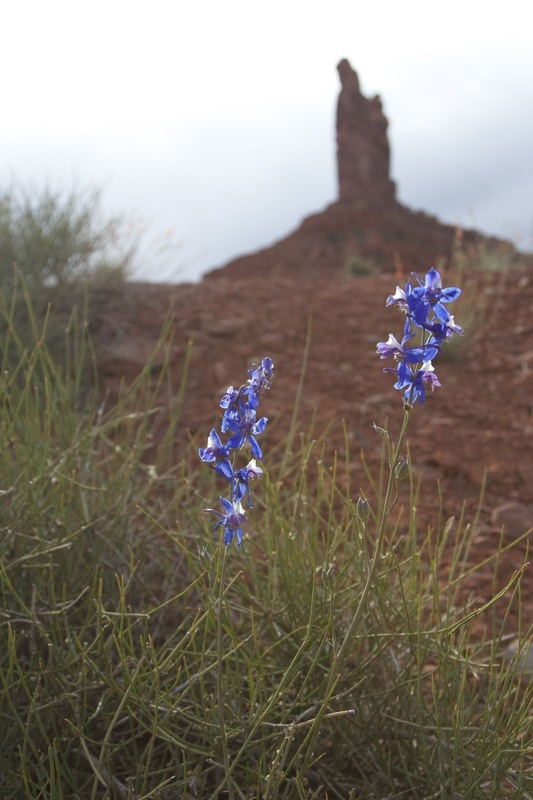 The perfect place to explore, and just a half days drive from Flagstaff. 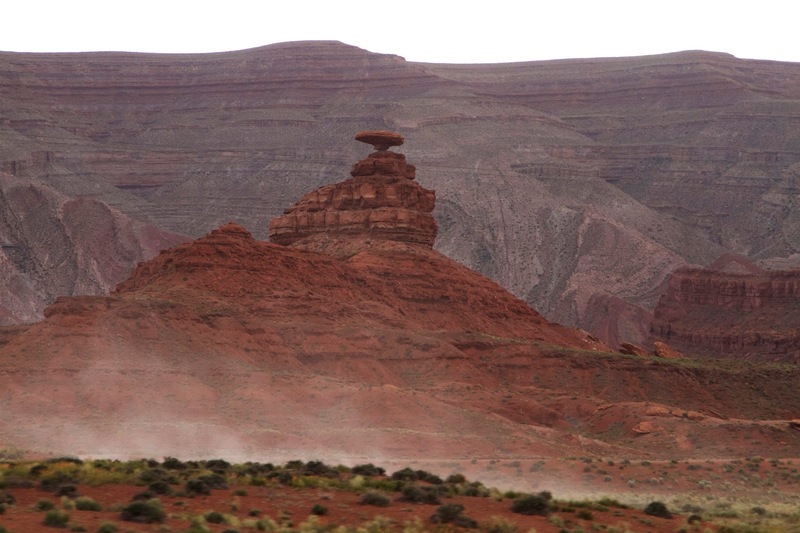 The namesake for Mexican Hat, Utah. 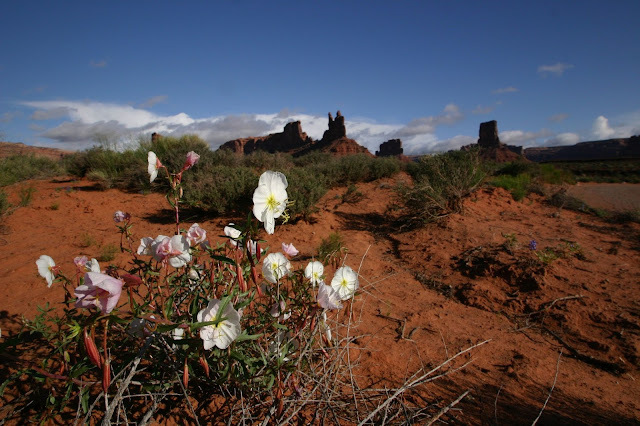 To get to Valley of the Gods from Flagstaff, drive up highway 89, turn towards Tuba City on 160, then turn north on 163 at Kayenta. 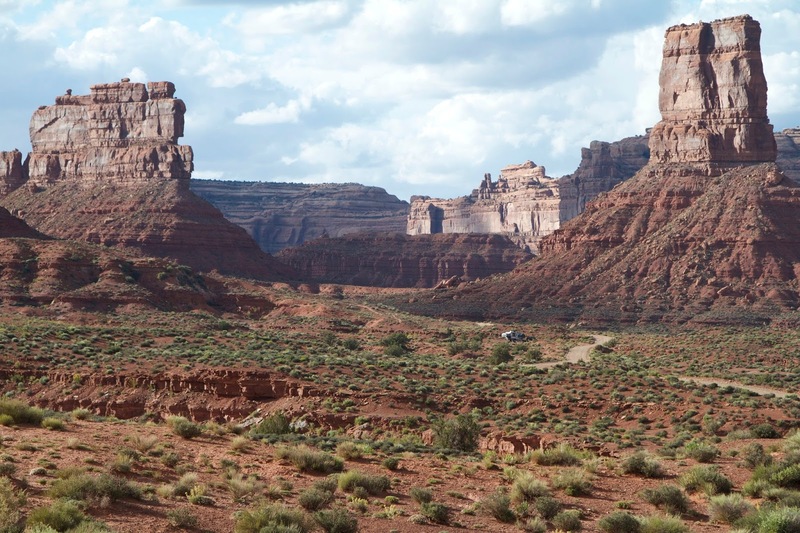 From there you cruise through the outskirts of Monument Valley to Mexican Hat, cross the San Juan river and wave hello to the Swingin' Steak Grill, and maybe stop in for one of their famous steaks, grilled to perfection as it swings over a wood fire. (Or so I've heard. We didn't actually stop. Next time!) 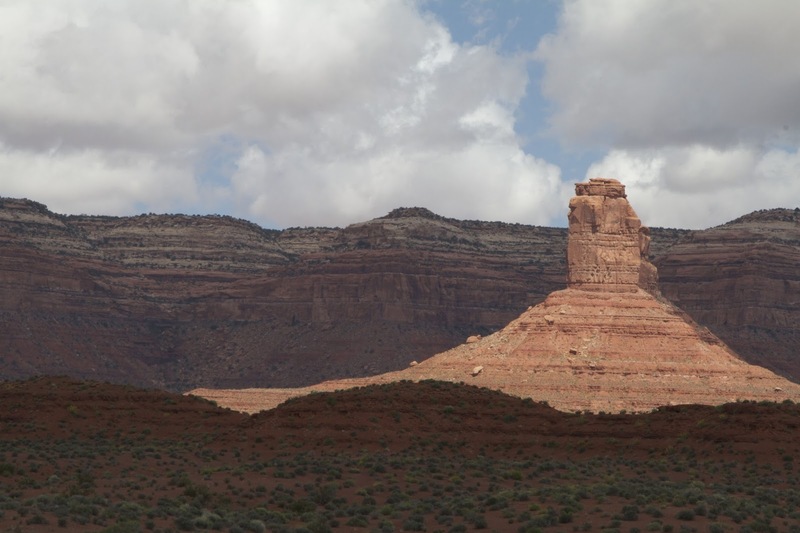 Take the turnoff at 261 toward Goosenecks State Park and drive almost smack into the side of a huge mesa. 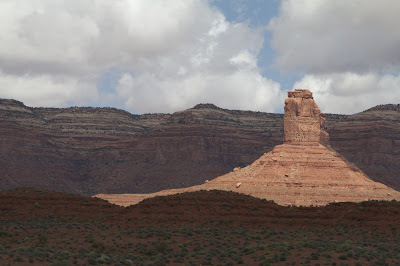 Turn right to get to Valley of the Gods; go straight and you'll be driving up steep switchbacks cut into the side of that mesa, the famous Moki Dugway. 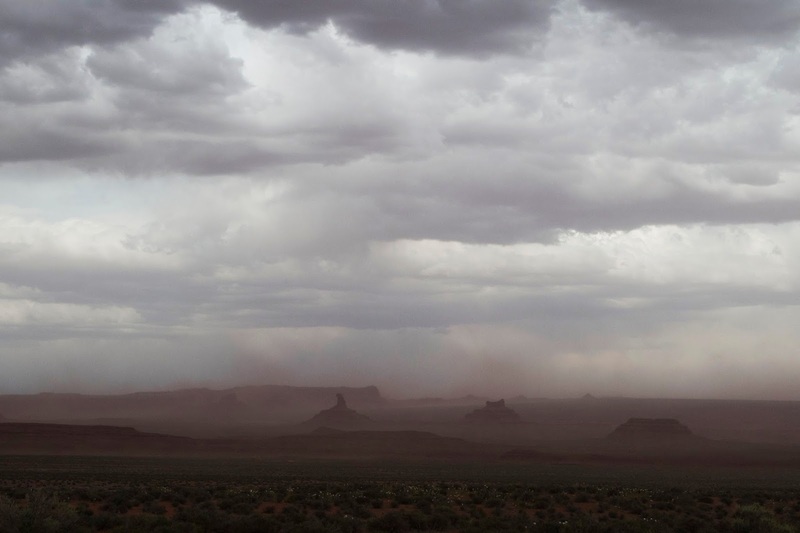 Wind, Dust, Thunderstorms. 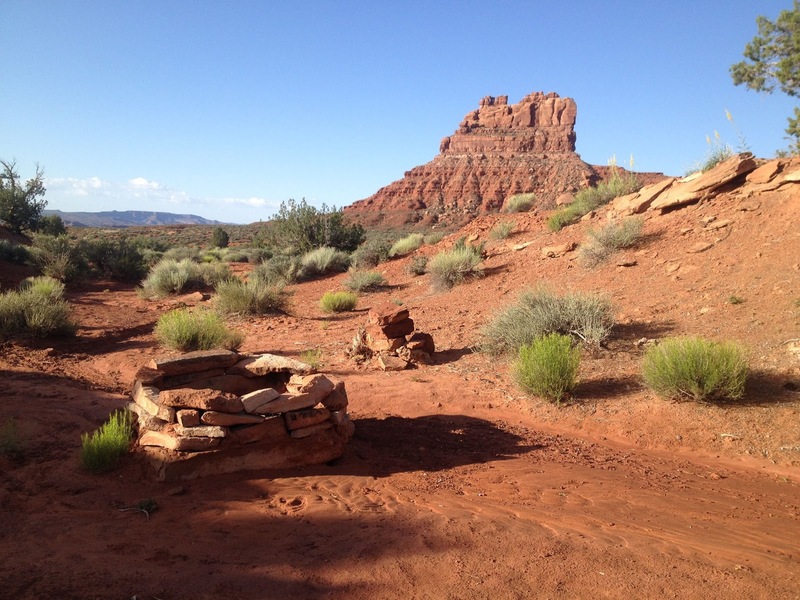 I'm beginning to think the name Utah is derived from the Navajo word meaning "Crappy Weather"
Now, I love Utah. I really do. The red sandstone that is so famously carved by wind and water into arches and hoodoos, towers and spires; so very grand. But why is it every time we go, the "sculpting" has to be in progress? What is it about us that attracts 50 mph wind gusts and thunderstorms followed by torrential rain? Isn't it supposed to be a desert? 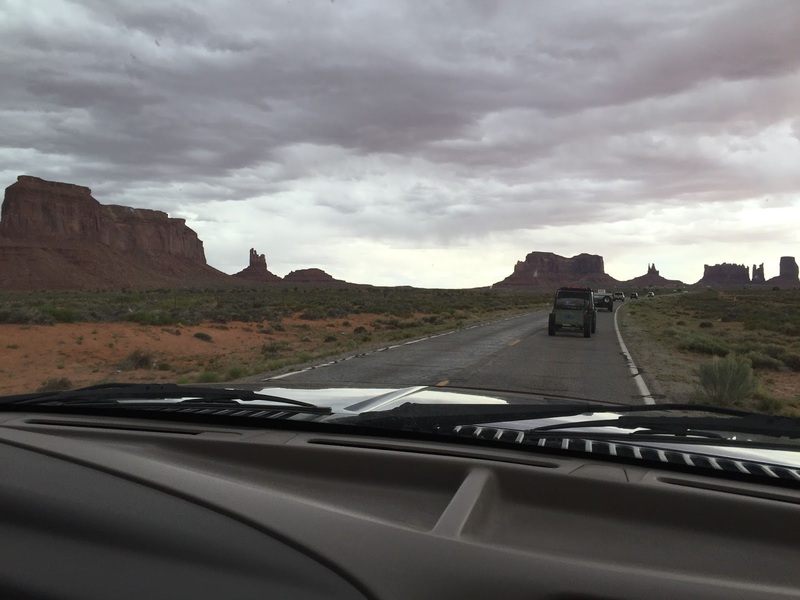 Driving through Monument Valley, through wind and rain. 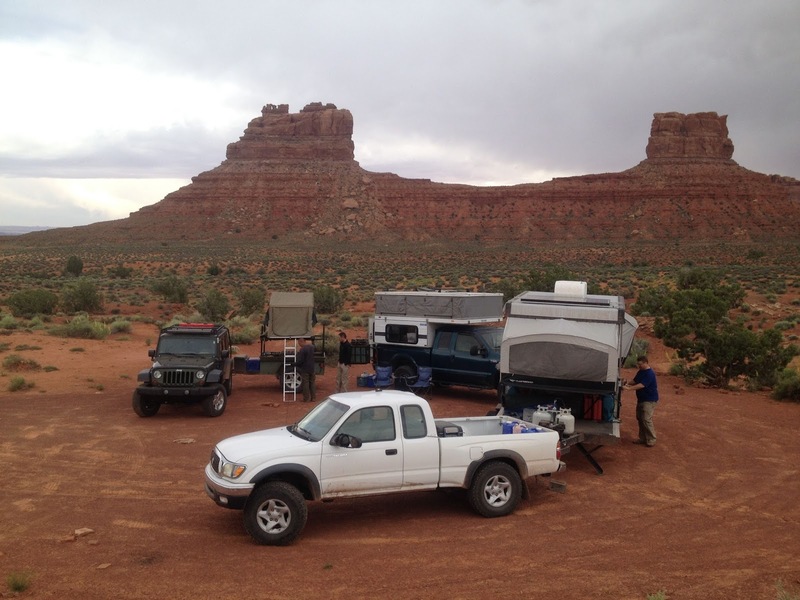 We convoyed with our friends, Craig and Rasa in their Toyota truck towing their gigantic tent trailer and Mel in his Wrangler with his tricked out old army Jeep trailer, our big Ford truck bringing up the rear. We watched the trailers wag back and forth in the wind ahead of us as Mark gripped the steering wheel as the truck tried to change lanes on it's own. Off to the left, huge black clouds were hanging low over the desert. Now and then a lightning bolt would stab down and seem to touch the "monuments" that make up the valley. This was going to be fun. 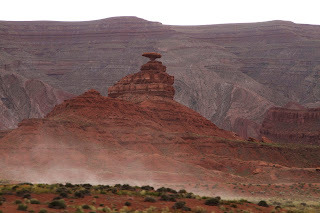 By the time we reached the entrance of Valley of the Gods, the wind was tearing across the park in gusts strong enough to bend the metal sign posts off kilter. We slowly drove down the gravel road, searching for a spot that was big enough for all three of our rigs, and with enough protection from the wind to allow us to pop up our respective campers and tents without having to chase them down the valley. Thankfully, we had all brought our FRS radios so we could communicate without having to get out of our trucks. If you've ever tried to get out of a car in this kind of wind you will understand the risk you take every time you open the door; watching your expensive set of topo maps along with various bits of road trip flotsam (napkins, apples cores, gas receipts) fly into the next county is not fun. Been there, done that. Valley of the Gods is on BLM land, which means dispersed camping is allowed anywhere a previous camp has been made. Off road driving is prohibited, but there are plenty of spots to choose from, ranging from large pullouts along the main road to campsites on spur roads right beneath some of the monuments. 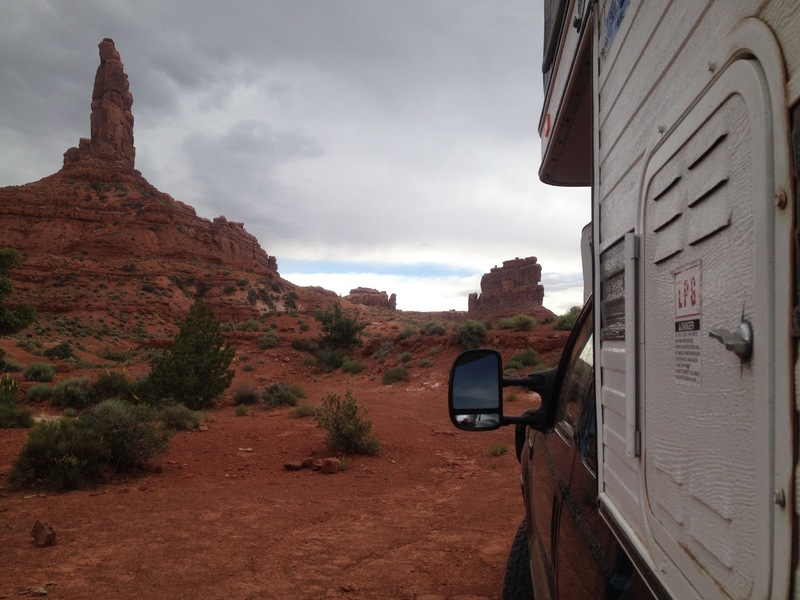 Circling the wagons, Overland-style. That's Craig behind his Fleetwood trailer, trying to hook things up while the wind was trying to rip everything out of his grip. The view from camp. Not too shabby. The storm made for a dramatic sunset that night. As we were setting up camp in the wind, the guys from Ninkasi Brewing Company drove by, stopped, backed up and handed us some beer (they had attended Overland Expo as well). 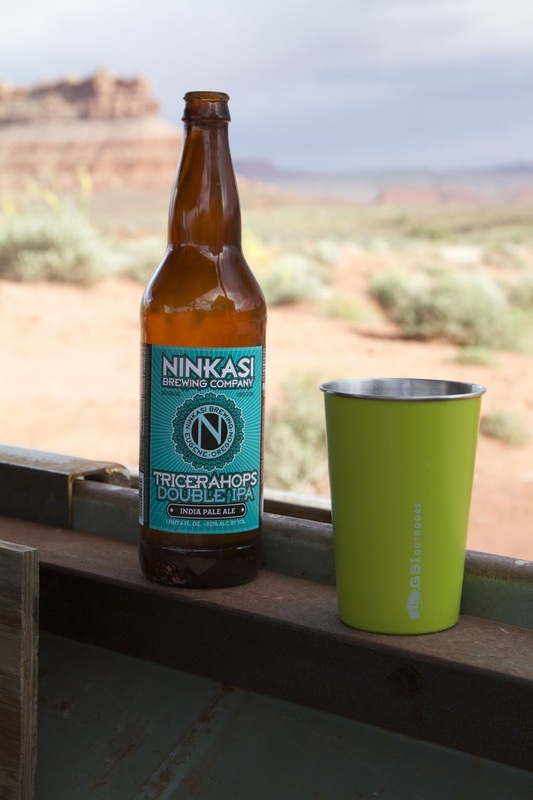 They said anyone who was willing to camp in this weather deserved a free beer. We are now fans for life. We found a nice spot nestled down behind a small outcropping. It was still windy, but tolerable. The saving grace of all this weather was it had rained just enough to keep the dust down. 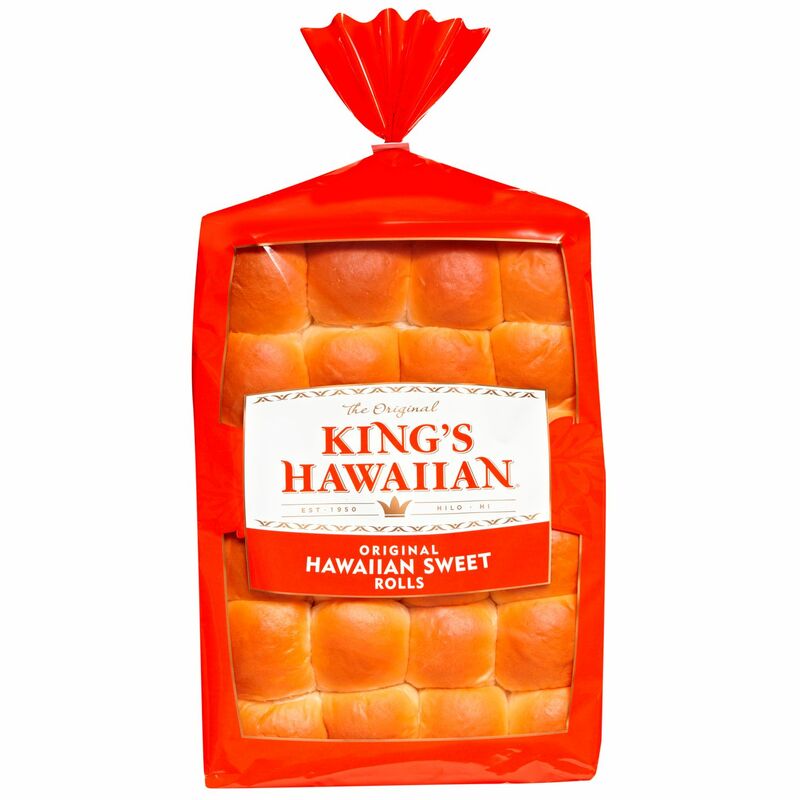 Small favors from the heavens. We set up camp then huddled in Craig and Rasa's trailer for dinner, holding onto our plates as the whole thing rocked in the wind. It definitely wasn't a-sit-around-the-campfire night. The next morning Utah decided to show us it's alternate personality. Waking up to silence, we looked out the window and found it was a gorgeous, blue sky/puffy cloud/red monument/perfect kind of day. We hopped out of bed, grabbed our cameras and walked down the road before our campmates were up. 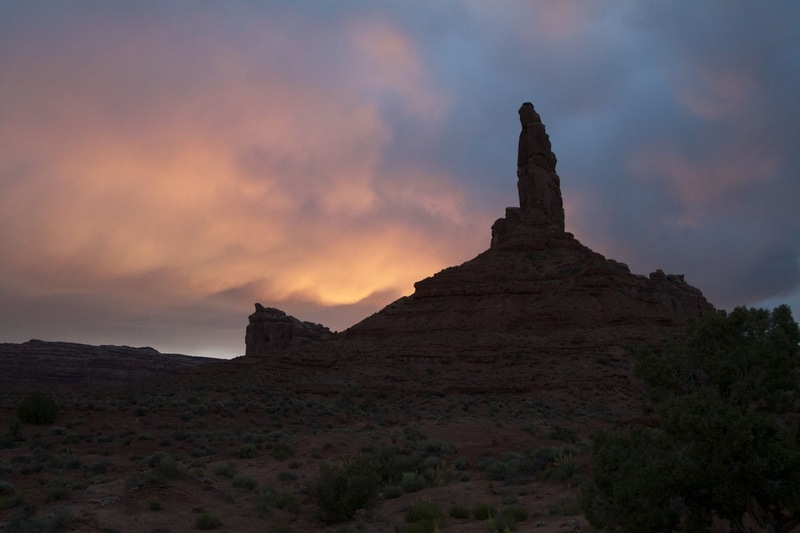 If there's a better time or place to take photos than Utah at 6:00am, I don't know where that is. 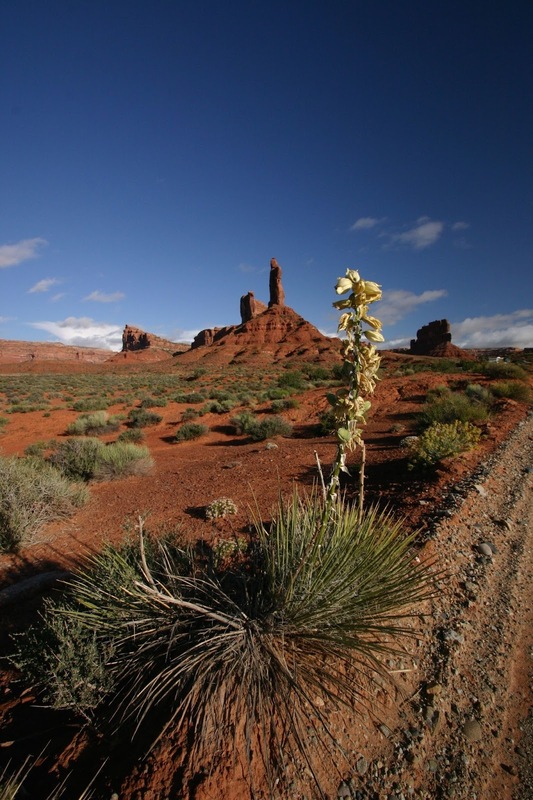 Yucca flowers try to out-spire the spires in Valley of the Gods. Evening Primrose decides to stay up until morning. A backlit daisy seems happy the wind stopped. Mark hurries back to camp after our photo shoot went a little long. Way off in the distance you can see our camp, the white dots to the left of the road under the center spire. We were having so much fun we didn't realize how long we had been gone. When we got back to camp our mates were waiting with breakfast for us. Scrambled eggs and veggies from the garden; perfection. It was the perfect day to take a little exploration trip and find the Hawaiian Rolls, stopping in to see Goosenecks State Park along the way. 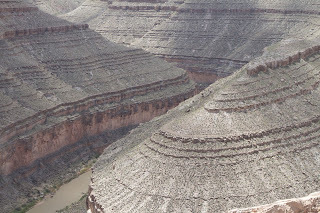 Goosenecks State Park overlooks an area where the San Juan River makes multiple u-turns, cutting sharp curves through the desert floor. Standing in one spot you can look down a thousand feet and watch the river as it makes it's way through three full curves. From above, it looks like a giant wiggly W. It's a spectacular view, and there are some primitive campsites if you like flat, windy places, but there isn't much else there. Notice the red tinge to the clouds. That's not Photoshop; the white clouds were reflecting the red earth beneath them. The San Juan river has cut it's way 1000' into the plains of Utah. We stood and stared down for a while as more people started pulling into the park. Turns out, this area is very popular with the European tourist crowd. There were lines of rented Harley Davidsons parked in rows along the edges of the lot. A group of riders pulled in behind our parked trucks as we were trying to leave. We waited and watched as one woman tried to back her motorcycle up to the curb. She almost made it; Craig and Mark helped her prop the bike back up after it spilled over. Note to self: do not rent your expensive fancy motorcycle to people whose total riding experience amounts to puttering around Florence on a Vespa. Next stop: Moki Dugway and the Hawaiian Rolls of Muley Point.